Improve your workflow processes, enroll more patients and fix your “no show” problem. Where the “rubber meets the road” in clinical trials, your site’s ability to effectively enroll and retain patients in your studies affects everyone, from the sponsor down to the patients themselves. Mosio’s service for Sites provides you with 3 main features enabling you to recruit, enroll and retain study patients more effectively, providing you with new operational efficiencies and improved communication efforts by using a powerful two-way text messaging platform built around your process. Are emails to your database losing their effectiveness? While 90% of emails are spam, 90% of text messages are opened and read within 3 minutes. Mosio helps you verify and convert your existing patient database into a list of subscribers that can receive and respond to text messages for your studies. Further, using Mosio’s Study Alerts provides patients with potentially 3 different ways they can contact you, putting control in their hands as to how they would like to communicate. With Mosio’s Patient Database Initiation Program, you can be assured that your organization is equipped with tools for communicating effectively with patients on their mobile devices. Communicate with patients on their terms. People are using the phone for voice calls less and less, while text messaging usage is on the rise. 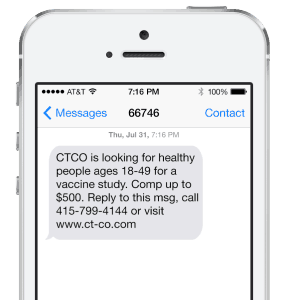 Using our “Talk or Text” with TextChat service, we’ll obtain a local number for you to use in your advertisements, giving patients the option to communicate with you the same way they do friends and family. Voice calls on the number forward to your recruitment office or call center and text messages are received and responded to via your secure Mosio account. 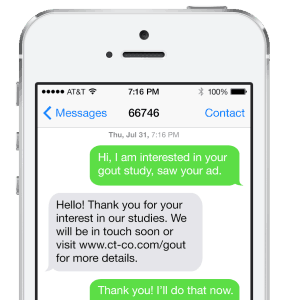 With Mosio’s Two Way TextChat system, you can customize scripted responses and automate conversations with patients to grab their attention when they contact your research center. Customize auto-responders based on the time of day and week, so patients stay engaged during and after business hours. 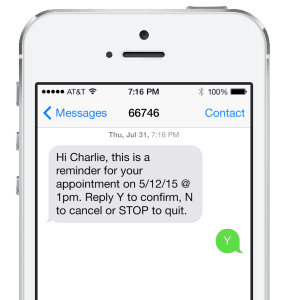 Our appointment reminders can save you significant time, money and headaches by making it easy to send appointment reminders via text message. Leverage your legacy scheduling system to send personalized text message reminders to patients of upcoming study visits, and confirm patient attendance with two way text messaging. Be notified immediately of cancellations, and rapidly reschedule patient visits. Prepare your patients by reminding them of specific study procedures during study visit confirmation. Improve trial compliance and patient adherence. Mosio for Research Sites was created as a way to augment your existing systems and processes to get more out of what you are already using. Together, these three features can help you improve your recruitment, enrollment and retention efforts, providing you with the ability to reduce the amount of resources required to get your work done. Contact us now for a data sheet and pricing. We can have you up and running within one business week.